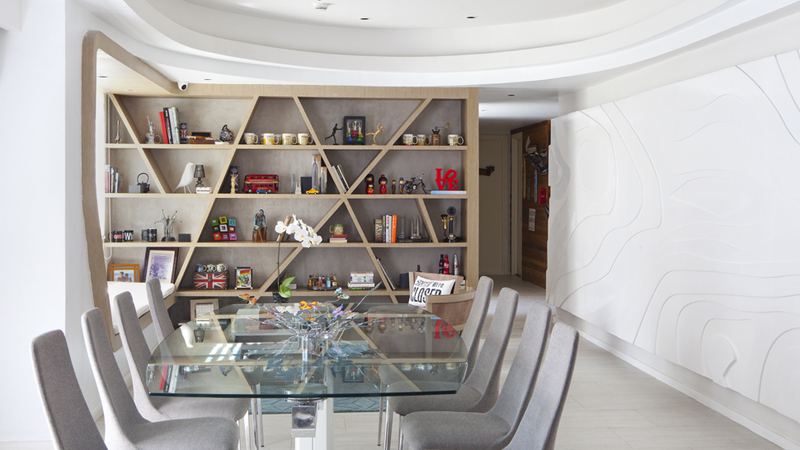 The cool style of this 208-sqm condo in Metro Manila is just out of this world! Some condominium units tend to become cookie-cutter homes, with each unit looking identical to the last. But this is not the case with Jedd and Leslie’s unit, as this couple’s condo resembles a stylish home of the future with its curved ceilings and walls, sleek and sinewy interior architecture, and ultra-modern furniture pieces. The young couple turned to Julia Sandra Uy of Uo2 Architects who took inspiration not from science fiction, but from Jedd and Leslie’s personalities. In spite of their differing personalities, the couple still had many common interests. They both loved outdoor activities, traveling, home entertainment, and collecting souvenirs. “We got the design inspiration from Jedd and Leslie’s activities, hobbies, and travels,” explains Julia. “The texture of the walls is provided by its terrain-like appearance,” she adds in reference to the textured “topo” wall in the living and dining area. The rest of the spaces feature curved recessed ceilings, a proliferation of soft and rounded furnishings, and highly textured raw concrete walls. Jedd and Leslie also wanted his and hers bathrooms with walk-in-closets, which Uo2 worked into the design, as the existing layout only had one bathroom in the master bedroom. The two bathrooms show the different characters of husband and wife: Jedd’s is kitted out with open shelves bursting at the seams with his outdoor sports equipment, while Leslie’s is a sweet but modern space with feminine touches such as a tufted ottoman and a crystal chandelier. If you’re looking for a home that beautifully pulls off a design of two different personalities, you’ve found it here—space-age style, outdoorsy gear, chandeliers, and all.